Successfully Added ATSC Digital TV Receiver for Cars to your Shopping Cart. 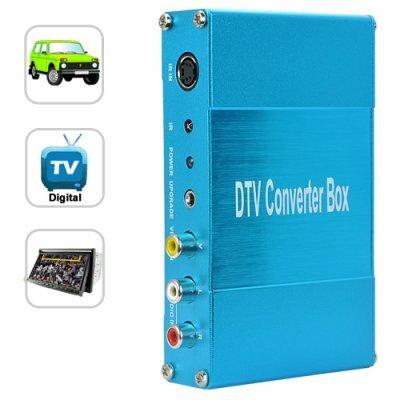 Digital TV Receiver for use in parked cars, mobile homes, and other stationary vehicles. Enjoy watching television in your car with this ATSC tuner for North America and other areas using the new ATSC digital TV standard. Don't miss a single minute of your favorite sports and TV shows - if you are ready to upgrade your Car DVD Player or in-car entertainment center to the new digital TV standard, then the CVNQ-C44 is the product for you! How does it work? Simple! This product works as an AV-IN to your existing Car DVD Player or in-car TV/entertainment center. Just plug it in, change video input to AV and now you are watching digital TV! Everything you need to get started is included, antenna, cables, remote control, and mounting hardware are all in the box. Add digital TV to your vehicle in less than 30 minutes. In stock in our warehouse, order yours today and we will express ship it out tomorrow! How easy is it to install in my car? For anyone experienced in installing car radios or car DVD players, it is easy. If you have never installed car electronics before, you should ask an experienced friend or professional technician for assistance. No, this product is designed to run off of a 12-24 volt supply from a vehicle battery. this item works great. easy to install and works like a charm.upgrading your moble video now made simple thanks to chinavasion.